Get rewarded by finding the most elusive pygmy hippos in Mafia Island. "Waswahili walisema lisemwalo lipo kama halipo laja" Swahili said, what is said exists and if it doesn't it is coming. I hope that is clear with you. Rumor has it that there are world famous pygmy hippos in mafia Island. I don't know exactly how I should frame this but the rumor has two facets. To some it's a mere lie but to others its so real and true like heart beatings. When a monster web source declare something most of us believe it all. Wikipedia reported that the existence pygmy hippos is just an illusion because there are no confirmed sighting. My long time online friend who runs Ras Mbisi lodge in Mafia Island, Michelle Vickers recently published a post and got my attention. Here is what she had to say and wrote on her blog. "Ever since we first arrived on Mafia, we have been looking for the elusive rumored Hippos that are reputed to live around the lakes at Chungaruma close to Ras Mbisi. We've seen droppings, we've had staff tell us they'd seen them that morning, I've seen the skeletons at the Fisheries Office in Kilindoni. Never seen one. However 2 guests that stayed in January this year did, and today they sent me a photo, here it is. 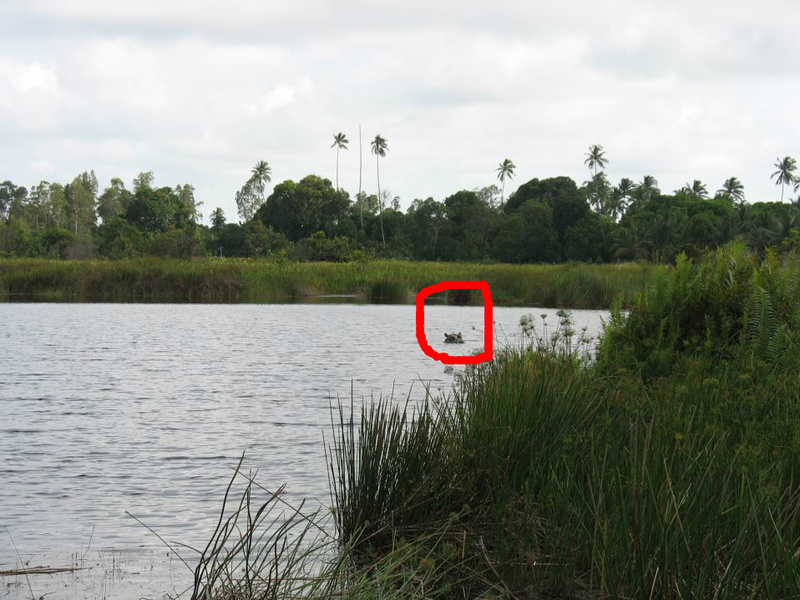 They do exist :)"
In the red ring is a pygmy hippo in Mafia Island as seen this January. Photo courtesy of Ras Mbisi guests. Ras Mbisi story made me dig dipper about the elusive hippos, as nick named. I went further by going through other informative sites to learn the entire mystery of their existence. Here are some other interesting stories in highlight. Over the next few months the Tanzania Marine programme wants to initiate a conservation and ecotourism project for the Hippopotamus (Hippopotamus amphibious). The island of Mafia harbours a relatively small population of hippos; these inhabit a network of lagoons found North-West of the island. Being it a nocturnal and semi-aquatic mammal poses numerous challenges when monitoring this species. There is no exact number of the actual population size in this area of Mafia Island, however, the Frontier team has managed to record around 20 to 40 individuals throughout their census. The next testimony left my jaw dropped! Super shocked. If the recording is this old what else can I say? This source is from Mafia Island Blog. I kindly ask @tztouristboard to confirm the existence of pygmy hippos in Mafia Island cc @rasmbisi thank u 4 ur efforts on that. What makes me go mad with my heart and adrenalin up so high is my curious adventure in mind in search of the hippos. I pray and hope not to be unlucky like these fellows 1 or 7 who really narrowed my chances to take on the adventure. If Naaman had to deep himself into river Jordan seven times to be healed from leprosy. (From the Bible). Perhaps I can get lucky with the hippos if I have to first deep myself into the Oceanic water of Mafia Island. Or maybe voodoo and potion might help!! This mystery also gave me an idea that may be Tanzania should search for hippos and not eggs on Easter Holidays. How cool could that be? I argue the Republic United of Tanzania under the Ministry of Natural Resources and tourism or Tanzania Tourist Board, to run a campaign or competition in search of hippos and reward those who would be successful. This might turn out to be an exotic exercise like no other and probably lure more tourists into the Island. “Easter Hippos Search” Isn’t that awesome and promising? It’s our call! See you in MAFIA ISLAND coming Easter. Note: Tanzania has lot of world heritage sites, and we have been depending on tourism for foreign exchange. We want to keep on gaining and benefit from these natural resources for today and the future ahead. After saying so I argue you to be a responsible tourist so that we can enjoy the natural wonders by conserving them and passing them on to the next generations. Thank you for your understanding.